It’s hard to believe that 2018 is almost over! Seems like we went directly from summer to winter, hopefully, this winter will be a mild one. We held our third quarter meeting and state show at the Platte County Steam and Gas show in Tracy, MO. We had a great turn out of exhibits and a good turnout for the meeting. At the membership meeting director elections were held and Greg Harrell, Rob Goodding and I were reelected to another term. Thank you to the Platte County Steam and Gas Association for hosting a great show. The chapter lost a wonderful member when Lou Walker of Jasper, MO passed away September 25th. Please let our thoughts and prayers be with Leon and the Walker family. Our next membership meeting will be the Christmas dinner at Pilot Grove, MO December 1st. Please contact me by November 24th so we can have a good head count for the dinner (660)346-0319 or by email ihctractors@yahoo.com we will be voting on the location of the 2021 state show at this meeting so far the only group bidding is the Elsberry, MO club. If you’re group is interested please contact one of the directors or myself. I hope everyone has a safe and happy holiday season and I hope to see everyone at Pilot Grove. Please plan on attending the 4th Quarter Meeting of the IHCC Chapter 1 to be held Saturday, December 1st, 2018. The meeting is the Annual Christmas Dinner so feel free to bring your favorite sweet treat to share. Lunch will be served at noon with the meeting following at 1:00 pm. The Directors are asked to meet at 10:30 am for the Quarterly Directors meeting. Louera L. Walker, 79, passed away Tues, Sept 25th, at her home in Jasper, Mo., surrounded by her family. Lou was born in Avilla, Mo., to the late Era F. and Louise “Caldwell” Culley. Her mother passed away at childbirth, and her Aunt Marie Chandler raised her along with her father and stepmother, Lucille Culley, who passed away August 9, 2018. After graduating from Sarcoxie High School, she moved in with her father and stepmother. Lou was united in marriage to Leon Walker on July 6, 1957, in Oklahoma. She spent the last 54 years on their farm south of Jasper, where she raised her three sons, operated a beauty shop for many years, and helped her husband with his dairy operation. 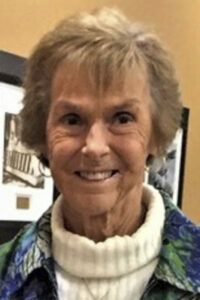 She also worked at McCune Brooks Hospital for many years, retiring in 2011. Lou was a member of the First Christian Church, in Jasper. She was always ready to help her family and friends; this special lady will be missed by both. 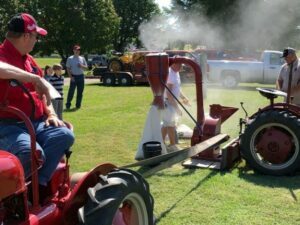 The last several years they have enjoyed going to Red Power Tractor Shows with Leon’s Farmall tractors that he has restored. They have made many wonderful friends during that time. Collinsville; three great- grandchildren, Jaxton Kincaid, Branton Walker and Abigail Walker, all of Jasper; stepsister, Carolyn Cole and husband, Gary; stepbrother, Jerry Culley and wife, Starla; as well as many cousins, nieces and nephews. Memorial contributions may be made to the First Christian Church, in care of Ulmer Funeral Home. Hello to my fellow Chapter 1 members, my name is Greg Harrell and I currently am Vice President of the Board of Directors. I asked Libby, our new newsletter editor if I could have some space in this newsletter to write a short note and she graciously agreed so I hope you will spend a few minutes with me. I want to start by saying what a great group of people belong to this organization. My wife Judy and I look forward to the board meetings, to see and visit with the many friends we have made since joining. Old Red Iron is what brought me to the club, and then Judy started attending meetings with me and we never cease to be amazed at the people who are members. The RPRU in 2015 gave us the opportunity to meet people from all the country and now when we get to attend others its like a reunion, and our quarterly meetings are the same. Being on the board was intimidating at first, but it allowed me to meet others and get to know them better by working on the RPRU and the Winter Convention and more. And that is kind of why I wanted to write this article. By being active you have the chance to meet so many more people, get to know them, hear about their families, and their tractors. Seeing the collections of some of these people is like a time machine, and finding out that not all are museum quality, that they may have tractors and other items in their working clothes like what I have, it helps me keep on going and not getting discouraged after seeing some in the magazines. I want to thank Tom and Doug for running for office this last board meeting. 5 people ran and 3 were elected but they stepped up and put their names out there, willing to do what it takes to keep the Chap. going. So many of you have served in various capacities over the years and I feel like I needed to in some way to pay back what you have done to keep this organization moving forward. For all the work that so many have done in the past, I say, “ THANK YOU” for doing all it takes so this great group still alive and vital. Thank you for giving me a club like this to share stories with. Thank you for providing such a treasure trove of knowledge and the people I feel comfortable calling or asking for help and advice when I see them. These are the reasons I agreed to run for office a few years ago. So if you have a little time, step up and volunteer to run for a board seat, or help at a show, or work on the museum trailer, or ask what you might be able to do to help, but be active. We have so many who have in the past and now we need to keep members to be active, lets keep our hobby and our chapter growing. There are many people who have membership in this chap but I have never met, I would like to meet each one, because I have yet to meet a member who didn’t have a neat old IH tractor or item to tell me about, or a great story. And speaking of stories, if you have one, don’t be afraid to get in touch with Libby and share it, she just might be able to put it in a newsletter to share with all of us. Thanks for letting me dribble on, and thanks for the friendships, and thanks for keeping our IH heritage and history alive. On October 13th the third Museum Trailer work day was held. Andrew Dawson, Sue Yeager, Rob Gooding, Bob and Brenda Buxton and Randy Weiss all participated on a cool blustery day with spitting rain in our efforts to put the trailer back together. Brenda provided a hot lunch which was well appreciated by all. She was rewarded by us getting 95% of the items out of her garage and basement so she can reclaim her garage just in time for winter. Everyone left late in the day with homework assignments for the next and hopefully final day of work. While we have not scheduled the next work day all agreed to keep an eye on the calendar and weather for opportunities to finish the job up. 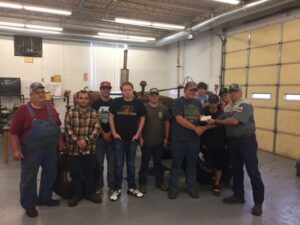 On Monday 24 September Tom Lindley and Randy Weiss met with the Conway FFA Chapter members and Advisor Joseph Stratton at the FFA shop class to provide the first $1,000 check for the Missouri Chapter # 1 International Harvesters Collectors Club Tractor Restoration Program for the 2018-2019 School Year. The class is highly motivated and eager to start the restoration of their 1949 M Farmall donated by a local citizen. The class has already begun tinkering with the tractor. They have been able to get it started with a little help and guidance from Chapter member Tom Lindley and have identified several seals and items that will need attention. They very proudly fired up the tractor during the check presentation this afternoon and it sounded really great. They still have a substantial amount of elbow grease and sweat equity to expend before it will be ready for paint and new rubber, but overall, they have been provided a good foundation for their restoration project. Tom Lindley will be the Chapter # 1 point of contact for this project as he lives just several miles from the school and knows the majority of the class personally. The school has a very nice shop for the project with lots of space and great lighting. We look forward to their project reports, photos and the finished product to be on display at the state Fair next summer! It was a cool crisp morning with very heavy dew as we (Randy & Penni Weiss) unloaded the Cub at the Tractor show. 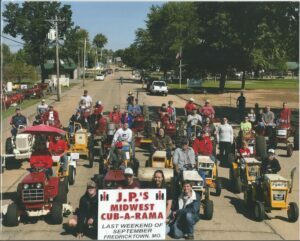 This could only mean we were at the 17th Annual Cub-A-Rama in Fredericktown, MO. The show, held the last weekend in September for the past 17 years is synonymous with cooler temps and leaves slowly turning (even if Mother Nature forgets sometimes). This year the weather was absolutely perfect as the sun rose on Friday it was a crisp 50 degrees, however there was a dark somber cloud hanging over the “Walker Tree” covered with a black ribbon to remind everyone of the recent passing of one of the greatest ladies involved with the Cub-A-Rama show every year as well as a beloved and faithful supporter of Missouri Chapter #1 family, Ms. Lu Walker. She always had a smile for all and you never knew what she was going to do next, but you could always count on her to help do what needed doing. She will be missed by one and all. 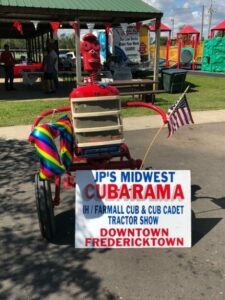 There were approximately 90 exhibits of mostly Cubs and Cub Cadets on display and a handful of parts vendors for the die-hard collectors to pick thru. Many of the implements and parts had been spoken for or arranged to be picked up at the show long before they ever arrived at the show, especially with things becoming hard to find we still managed to bring a few extras home. 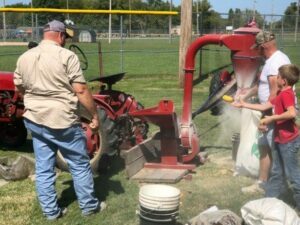 One of the highlights of the show was the operation of the Model 4E Hammermill, kids had a blast trying to keep up with the feed grinding operation. The annual Pedal Tractor Pull was also a very enjoyable event to watch; the children really put their all into getting down the track the farthest. We enjoyed an implement walk thru where the experts explained the purpose of all the exhibited implements everything from cultivators to plows to seeders as well as a demonstration on how to properly place the decals on your restored tractor and the inner workings of the IH magneto. There was something for all to enjoy. 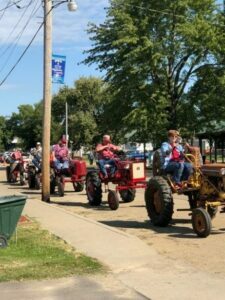 On Saturday at 12 noon we took our annual Parade of Power thru the square at Fredericktown and back to the show grounds where a photo of the participants is taken each year to commemorate the show. Not every tractor participated but we had a great time and had quite a few spectators along the route. The Show is the closest thing to a family reunion I can think of, this year was special as the “Buddy Banks Group” cooked up some “Pasta-laya” which is Louisiana style pasta, chicken, sausage, green beans made in a great big pot for the family style dinner Friday night. Buddy primarily supervised, Ms. Hope and crew were clearly in charge of the cooking operations. At 3 PM on Saturday as is the case every year Jamie Hargis, director of the show had a young child draw the winner for the 50/50 the cash prize this year was $250 and the most prized trophy of all the brand new LT42 Cub Cadet mower donated by Cub Cadet. Everybody left the show extremely happy, especially the winners of the cash and mower. Best exhibit, most exhibit items and show favorite all received a hand painted plaque commemorating their achievement. To help support the Cub-A-Rama and generate some additional interest in the show, the directors have purchased a restored 1950 Cub tractor to be raffled off at next year’s show, Jamie hopes to get the tractor taken to as many shows as possible to help sell tickets, if you would like to help out please contact her via the Cub-A-Rama website (www.cub-a-rama.com or call her 573-561-4524). A note of thanks to Bob and Brenda Buxton, for helping Penni and I at the Chapter # 1 table on Friday. The club does very well at the show selling merchandise and we generally receive two or three membership renewals or new members each year. 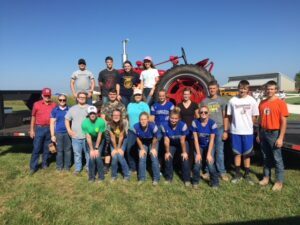 On Tuesday 18 September, 2018 the University of Missouri, Columbia hosted its annual Future Farmers of America (FFA) Day at the Bradford Research Farm. Approximately 1850 students and advisors from 67 Missouri Schools participated in a round robin rotational event in which 22 different stations were visited by each school. Students got to spend around 12 -15 minutes at each station. This year Chapter # 1 of the International Harvesters Collectors Club got to be one of those stations. 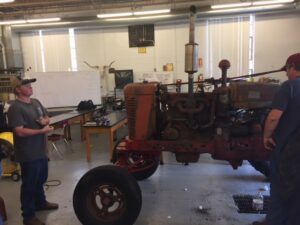 Chapter # 1 has a Tractor Restoration program in which a Missouri FFA Chapter is granted $2000 to assist in the restoration of an IHC tractor. The club also assists with technical support, points of contact for grants from other industry (such as tires) and the all-important information of where to find those sneaky little parts that just cannot be bought over the internet. 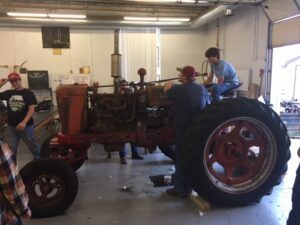 The club has seen several FFA chapters across the state successfully restore a donated IHC tractor and then sell the tractor for profits to support the FFA chapters needs. It has proven to be a very helpful program for both the FFA chapter and Chapter # 1 of the IHCC, not only do the students get to work on and restore a tractor, they enhance their team building skills and learn a little about the mechanics of a bygone era and the IHCC gets to see a restored tractor escape the scrap yard and live on to provide some lucky individual the opportunity to enjoy owning the restored red tractor. Richard Rackers and Randy Weiss (directors of Chapter #1) spent the day providing the students the basic guidelines required to participate in the restoration program. It was a perfect opportunity to get face to face with the students (and advisors) to provide all the information, while electronic media (e-mail, Facebook) has been our go to method in the past, this time we went directly to the students. Most of the students seemed interested in the program, so the guideline cheat sheets we handed out to them may yield us some additional applications for the next few years. 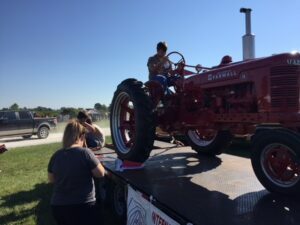 The Chapter used a recently restored Farmall H tractor as “eye candy” to get the students interested and curious about station (worked really well!!). Several of the FFA chapters posed for chapter photos around the tractor to remember the event. Benton Naylor (Chapter # 1 member and University employee) managed to grab some photos for us in between his duties of bus parking monitor and general “cat herder” of the day (1800 teenagers in one field at the same time)!!! The weather was quite warm (HOT!!!) and sunny, both Richard and Randy got nice and toasty by midafternoon. The Boone County Cattlemen cooked a superb lunch for the students and speakers, with iced drinks to rejuvenate us for the final few hours of the day. Randy and Richard used the opportunity to hand out nearly 80 of the 2015 Red Power Round Up Showbooks from the club merchandise items which quickly became a big hit with the students. It was nice to see them sitting around the treeline in the shade looking and pointing to the pictures of IHC equipment in the books, proving once more that a picture is worth a thousand words!